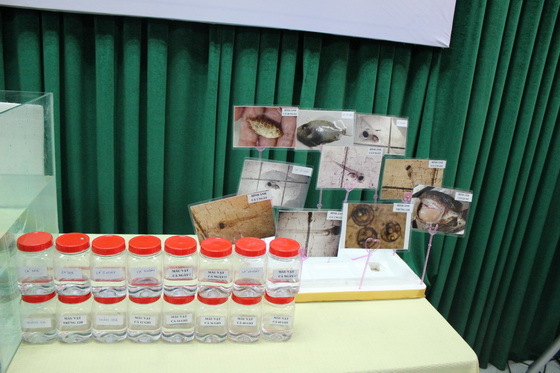 In the morning of 16 June 2016, the announcement ceremonmy of successful artificial reproduction of Siganus guttatus in Thua Thien Hue took place at the College of Agriculture and Forestry - Hue University. The study was carried out in nearly two years (2013-2015) by the research fellow Le Van Bao Duy - Faculty of Fisheries, College of Agriculture and Forestry - Hue Universit and his team, funded by Hue University VLIR - IUC program. Assoc. Prof. Dr. Nguyen Quang Linh, Vice President of Hue University attended the ceremony. At the ceremony, the research fellow Le Van Bao Duy briefed the artificial reproduction and rearing of Siganus guttatus. After nearly two years, in cooperation with Ghent University (Belgium) and Nagasaki University (Japan), the research team successfully improved the process of artificial reproduction and rearing of Siganus guttatus all year round with high and stable survival rate. The research team found the optimal environmental conditions, reasonable diet and effective disease treatments. Besides, this process was highly sustainable. Water environment was treated entirely with microbiological technology imported from Belgium and was completely free from antibiotics. Larval food was produced using the latest technology currently applied in Belgium and Japan. It is widely known that artificial reproduction and rearing of Siganus guttatus is one of big challenges for Vietnam marine fish farming for years, due to unsuccessful larvae hatching. The survival rate of 6-7 day old larvae is very low and unstable. The main reason was said to be related to water quality, nutrient requirements and diseases. Assoc. Prof. Dr. Nguyen Quang Linh - Vice President of Hue University congratulates the reseach fellow Le Van Bao Duy and his research team on successful artificial reproduction of Siganus Guttatus. Assoc. Prof. Dr. Nguyen Quang Linh said that the team had many advantages, such as the financial and technologcial support from many foreign projects, and available infrastructure of the College of Agriculture and Forestry - Hue University, which contributed to the success of this research. Assoc. Prof. Dr. Nguyen Quang Linh hoped the team would continue to carry out further research, have enough seed to provide for farmers throughout the year, opening up opportunities for development for Siganus guttatus farming in particular and marine fish hatchery in general in Hue City and in Vietnam. Assoc. Prof. Dr. Le Van An, HUCoAF Rector said that it was the research results of the college's scientists in recent years. Besides the hard work of the scientists, the success was achived thanks to the financial support from projects and agencies inside and outside the collge and VLIR - IUC program. In the time to come, Assoc. Prof. Dr. Le Van An urgued the reseach team to further improve the process of artificial reproducion of Siganus guttatus. Asoc. Prof. Dr. Le Van An also hoped that fish farmers would be have commercial fish to sell on the market, so that they can generate income from Siganus guttatus culture and so as to better satisfy the needs of society. Assoc. Prof. Dr. Hoang Huu Hanh - Coordinator of VLIR - IUC program congratulated the research team on fisheries in Project 2, VLIR - IUC program. This result was achieved ahead of time. In two years, the Assoc. Prof. Dr. Hoang Huu Hanh said that the College of Agriculture and Forestry - Hue University has achieved remarkable results in the fields of agriculture, including animal husbandry, aquaculture, and farming. VLIR will last for 12 years. Assoc. Prof. Dr. Hoang Huu Hanh believed that VLIR - IUC would fully support scientific researchers to carry out many more researches, to meet the needs of the society as well as to speed up the economic development of the country.